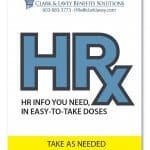 News & Events - Clark & Lavey Benefits Solutions, Inc. Boot Camp HRx’s next webcast in the quarterly series of 1-hour interactive live-streamed sessions will be held, Thursday, June 6th. Details and registration information to follow soon. Partner Sponsor: Health Plans, Inc.
Did you know that a hacker attack occurs every 39 seconds or that 95% of security breaches occur due to employee error? As a business leader, how do you protect your business, customers, and employees from near constant threats? Join us as cybersecurity industry experts share insights into the constantly evolving threat landscape and find out what you need to know to protect your critical business resources and your reputation. Complimentary Breakfast and Networking, 7:30 – 8 am. Program 8 – 9 am. Register by April 22nd online at www.rivier.edu/presidentscircle. Clark & Lavey is proud to join the Telegraph in honoring 40 young professionals under 40. Our community is filled with many young professionals who are doing great work each and every day, and although they may be known within their work, we feel the whole community ought to know the good work they’re doing. We want to bring attention to that. Here’s your chance to nominate someone you know who deserves to be recognized. Nominations are open from April 25th – May 30th. Learn more or nominate someone.